Fire crews are tackling a serious blaze in a workshop at the Fire Service College in Gloucestershire. 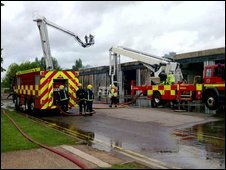 Twelve fire engines are stored in the building at the college in Moreton-in-Marsh along with 1,200 litres of diesel and 500 litres of hydraulic oil. Eleven of the fire engines have been destroyed at a cost of £116,000 each. Gloucestershire Fire and Rescue Service sent 58 firefighters to deal with the incident after receiving the call at 0913 BST. Sally Sheen, of the Fire Service College, said: "At around 9 o'clock this morning, a fire was found in a reserve workshop at the Fire Service College. "The workshop contained a small number of appliances and equipment. "The local fire service has contained the fire to the scene of origin. 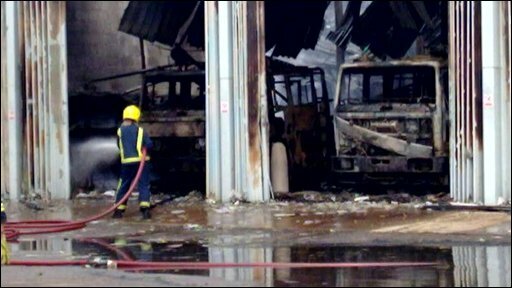 No-one was hurt and the main business of the Fire Service College will carry on as normal." Crews are using breathing apparatus, an aerial ladder platform, six jets, a water bowser and six fire engines and say that the fire is currently contained. The single-storey building on the college site is said to be "well alight" and the fire service said they would have to remain there for some time before it is completely out. They said they did not believe anyone was in the building. The college has been established in the market town for more than 30 years.